Do you know a rebellious teen? How about an agnostic or a workaholic? Those sorts are frustrating people aren’t they? Instead of accepting the truth and peace of Jesus Christ, they run and reject. Oh, and do you happen to know Randy Hain? He is the co-editor of the Integrated Catholic Life (along with Deacon Mike Bickerstaff) and a God-centered, Catholic, family man. He is not at all like those frustrating sorts. Not anymore, that is. 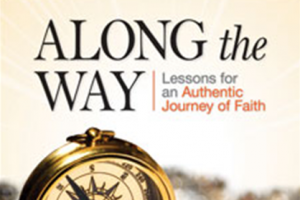 In Randy’s second book, Along the Way—Lessons for an Authentic Journey of Faith, (Liguori Publications) he reveals the path that led him from lost to found. He shares the lessons he learned on his journey to Catholicism, which began by dropping out of the Baptist church. Randy’s book is not a tell-all but rather a tell-some—just enough to know where he came from and why he doesn’t want to waste a moment of God’s time. He is now dedicated to challenging others to live a life filled with meaning and recommends setting three priorities. 1. I will serve Christ and love him with all my heart. 2. My family is my primary vocation. 3. My workplace is also my ministry. Randy gives his own personal insights as to how to internalize them. For instance, he says that daily surrender and ongoing conversion are not one-time events. He challenges people to give God an hour a day of prayer and suggest praying the rosary while on the way to work, and continually turning our thoughts towards God. Becoming passionate about the Eucharist is an important way he makes real the goal popular among Protestants, to truly have a personal relationship with Jesus. Randy also points out that we should pursue joy, not happiness, in that joy is Christ-inspired rather than world-inspired and fleeting. Randy joined the thousands of others who become Catholic each year. But as one in love with his newfound faith, he was struck by the fact that there are also thousands of others leaving the Church each year. “Why don’t all Catholics feel the joy and passion that we converts feel in our practice of the faith?” he asks. He contends that familiarity can lead to boredom, which leads to apathy. That is not good for the soul or good for the Church, so Randy tackles the situation with challenging questions and suggestions. It is a vibrant prayer life that leads to a vibrant faith life, according to him. That means taking everything to the Lord and beginning and ending each day with prayer. He writes: ”Spend time in Adoration before the Blessed Sacrament, pray the Rosary, do the Jesuit Daily Examen, pray the Divine Mercy Chaplet, meditate on Scripture, etc.” By surrendering and converting daily, accepting and studying the Catholic faith, and actively practicing it, we breathe life into faith. Along the Way, does more than just to help make the Catholic faith personal. Randy also encourages us to go out and evangelize and provides a framework to witness to the world. Be salt and light. “Next to prayer, this is the most effective thing we can do.” He states that if we are joyful examples of Christ’s love, then others will want to know our secret. Share our journey with others. Give witness to the blessings of Jesus in our lives. Share or give a book, DC, DVD, article or homily related to the faith. This is an easy way to spread the good news. Along the Way will be released November 15 but can be pre-ordered now.